I’m trying to finish — or at least make significant progress — on one unfinished quilt top per month. This Sampler Quilt is my second-oldest UFO and one of my first efforts, from probably 15 or 16 years ago. However, I love the “pinky-ness” of these fabrics, so this top is getting a total makeover. I had such a good time with the cornerstones and sashings on the turquoise quilt that I am using cornerstones again. This time in reverse values, with dark sashings and light cornerstones. When I was unpicking the seams from the old sashings, some of the blocks frayed badly, so I have trimmed them all down to 12-inch squares. I will lose some of the tiny points, but I’m not going to worry about that. It’s an experiment quilt and won’t be a great loss if it doesn’t turn out well. After all, it’s already been sitting in boxes and cupboards, unused and unloved, for many years! But I’m sure it’s going to be just fine now. Finished is much better than not! I’m sure it will look superb. The sashings are great. I’m working on my accuracy and it’s not going so badly! Great that you revived an old project. I like the new look with the pink sashing. 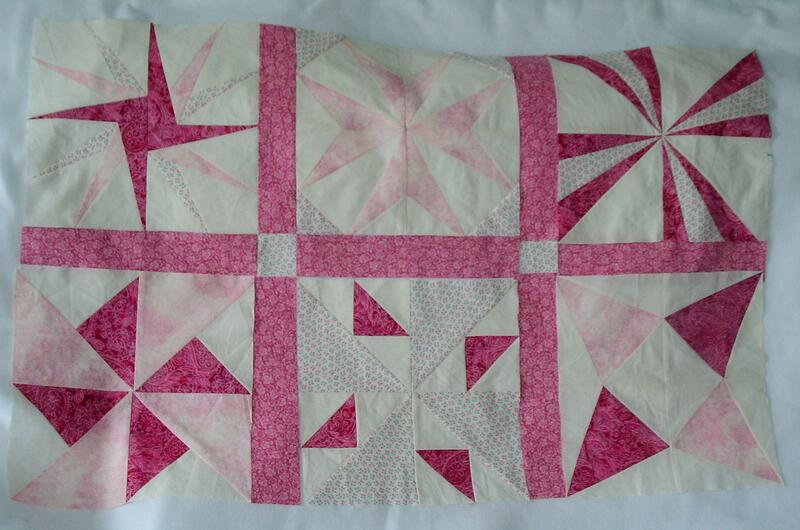 Looks like a completly different quilt; the sashing allows each blocks to shine. The old one look too washed out. Great idea you are following through with. I really like that quilt and I am not usually fond of pink. but it looks so girly and will be beautiful when it is finished. My first quilt has so many mistakes but because it is my first quilt it is really loved. I have never been a pink girl, but I love the way the light and dark pink fabrics play against each other in your quilt. 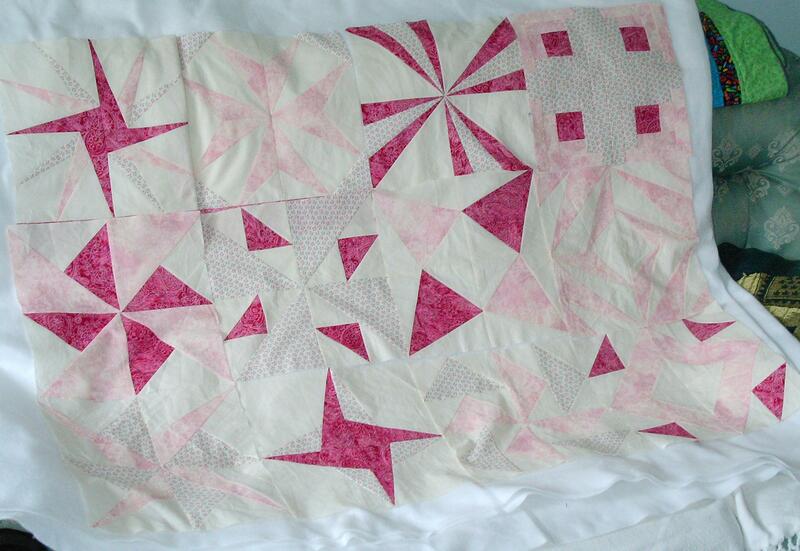 Anne Sutton of Bunny Hill is causing me to soften my attitude about pink and your quilt is definitely helping. It must feel good to take this quilt out of hiding and give it new life. Way to go in salvaging an old project! And yes, completed (minus a few tiny points) is better than getting old and NON-finished in a cupboard. There is alot to learn from UFO’s…the finished project isn’t always the most important thing! I do hope that now it will pass from the “Unloved” pile to the cherished and “Much Loved” – often touched – smiled upon – remembered with affection – pile! If it were mine, it certainly would – it is lovely :0) and I am sure will finish up as “Gorgeous” category. You must feel very pleased with yourself!